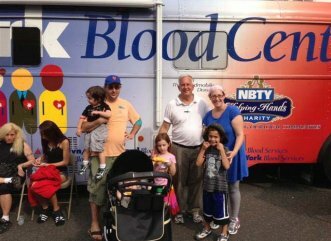 John Kennedy held a blood drive at the annual Ronkonkoma Day Fair. Ronkonkoma, NY - September 4, 2013 - On September 1, 2013, Legislator John M. Kennedy, Jr., Minority Leader of the Suffolk County Legislature, in conjunction with Long Island Blood Services, held the next stop of the 2013 Blood and Guts blood drive tour at the annual Ronkonkoma Day Fair. Despite the less than ideal weather, many eager citizens made the attempt to donate blood, with 70 pints of blood being collected while over 100 people made the attempt to donate blood. Any person, who donated blood, will receive free New York Mets tickets in the mail for an upcoming game as well as the chance to win Super Bowl tickets to this year’s game. If you missed the Bloodfest, Legislator Kennedy’s Blood-and-Guts Tour will be making stops at local street fairs throughout the rest of the summer and the fall. The next stop will be at the Nesconset Day Street Festival on September 8th. If you are interested in making a blood and you were unable to attend the Ronkonkoma blood drive, please contact Legislator Kennedy’s Office at (631) 854-3735 for information on where the Bloodbath Tour will be making additional stops. Groundhog's Day Predictions, Celebrating Valentine's Day, News & More in February 1st's Newsletter! Subject: LongIsland.com - Your Name sent you Article details of "Legislator Kennedy Helps Fill the Blood Banks With His Blood and Guts Blood Drive Tour Stop at Ronkonkoma Day"